The Pro-Fit 3672TFS jetted bathtub is a spacious tub with integral armrests, attached tile flange for installation under a shower and pre-attached skirt. 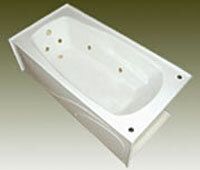 This bathtub is ready for a standard alcove installation. 71.25" x 35.5" x 23"